Limit my carb intake. I follow the Atkins "net carb" counting method when looking at carbs which means you subtract the amount of fiber from the amount of carbs to arrive at your "net-carb" count. This is what makes it possible for me to enjoy all the soups and chili below! Eat breakfast and don't skip meals. Drink lots and lots and lots of water. I try to stay between 20-40 net carbs per day (20 on a good day, 40 if I'm eating Sunday dinner at Mama's). My intention is to continue eating this way until I reach my goal weight and then slowly start introducing more carbs back into my diet. I don’t think I’ll ever go back to eating many though because, I’ll tell you, I can’t believe how fantastic I feel when I limit my carb intake. Even after eating a huge meal, I don’t feel sluggish or weighed down. I always have energy and I never have cravings. Note that all text IN BLUE is a link to a recipe or other source. I never used to eat breakfast – at all – but when I hit a weight loss wall a few weeks ago (barely lost 5 pounds over a 6-week period after having lost 20 pounds quickly) I decided to try to “reset” my metabolism by eating breakfast as soon as I woke up every morning and not skip any meals. If you follow my Facebook page then you would have seen this post where I shared how I lost 10 pounds in 9 days simply by adding breakfast to my schedule. Can you believe that?! So, I’m a bona fide believer in eating breakfast now! I hope this section doesn’t disappoint but I do not – repeat: DO NOT – have enough time in the mornings to cook anything special. I already get up at 5AM… I’m not getting up earlier than that for gourmet breakfasts! I work across town so I’m not home at lunch time. I either pack my lunch with leftovers from supper or eat out, choosing some of the following. Note: Eating beans and legumes that are higher in carbs but also super high in fiber and protein has worked great for me but it might not work for you. Try things out and see what works for you and what doesn't. Cut bacon into small strips then cook in a large skillet until crispy. Remove bacon from pan with a slotted spoon then add shrimp to skillet to cook in the bacon drippings.Season with pepper then sauté until cooked through. Remove shrimp from pan with a slotted spoon. Add butter, onion and celery to pan then sauté for 2-3 minutes. Add cauliflower, garlic, ginger, sesame oil and soy sauce to pan and continue sautéing until cauliflower is al dente (about 5 minutes). Season with black pepper and additional soy sauce to taste. Clear a spot on the side of the skillet, pour eggs in and scramble. Add cooked bacon and shrimp to skillet and mix everything well. Yes, I’m serious! I’m doing the low-carb thing so as long as I get a dry rub or wing sauce that isn’t sweet, I’m good to go. Choose any meat that isn’t breaded and avoid potatoes and pasta side dishes. I usually get green beans, broccoli, black-eyed peas, pinto beans, cabbage, collard greens, sliced tomatoes or zucchini. Red Robin (and lots of other places too) will wrap any burger in lettuce instead of putting it in a bun. Order steamed broccoli instead of fries – the broccoli is ‘bottomless’ just like the fries! This is chorizo and chicken that’s seasoned and sautéed then topped with cheese sauce. Note to self: figure out how to make this. Just ask them to leave off the Texas Toast. They’ll look at you funny but if you’re like me, you can’t stare down a buttery, perfectly crispy hunk of bread without losing your religion and shoving the whole thing in your face. Ask for a side salad instead of fries, celery sticks instead of coleslaw and ask them to hold the Texas toast. This is, hands-down, my favorite fast food salad of all! The carbs on this are a little higher than the other choices but you can only eat so many salads, right?? I order this WITHOUT the spicy brown honey mustard because it's terribly, syrupy sweet. I don't know the carb count on the mustard but it's got to be pretty high so ordering it without reduces the carb count. I also rip off as much of the wrap as I can and still manage to hold the thing together (which is usually quite a bit). Order with a side salad instead of fries. Just say ‘No thanks!’ to the crackers they offer you and stay away from the fat-free dressing because it’s full of carbs. You can get fresh sliced tomatoes instead of grits or hash browns at any WH! Just order this without the rice. The cool thing is every Taco Bell I've gotten this from seems to add extra everything else to make up for the missing rice. Score!! I always ask for this without the sweet barbeque glaze drizzle because a) I don’t like it – I think it makes the salad super sweet and overpowers all the other flavors but also because b) it knocks off 11 grams of carbs when you leave it off! I had a hard time switching from my favorite dark beers to the low carb varieties (like, really hard) but I got used to it eventually. I got a GREAT TIP from my friend Stuart who said to add a chunk of fresh ginger to the beer (if you have your beer in a glass you can just keep using the same knob of ginger for a while). This totally transforms the beer into something worth drinking! It reminds me of, well, ginger beer! Thanks, Stu! If these recipes and selections don't fit your definition of "low-carb' then please, do call the Carb Police. I think the number is 888-WORKSFORME. This collection was featured at the Weekend Potluck! I need to do this. I have to do this. It's scary!! Thank you and congrats on your weight loss! I follow the same plan, and I agree with how energized I feel. I used to head to bed around 8:00, now I have to force myself to bed at 10:00. I am at 11 pounds down. Keep up the good work. Thank you so very much for sharing. I'm going to give it the good try. So happy for you! I eat breakfast, but it is the hardest meal for me cuz I don't like breakfast foods that much. I eat alot of leftovers. This morning I had Buffalo Chicken Chili :o) So I really appreciate the breakfast ideas! Congrats on weight loss, 35 pounds is awesome :) How do you eat the recipes with beans though? Beans are very high in carbs? No judging, just wondering. I know you subtract fiber, but still any recipe with beans would put you out of the 20-30 carbs a day very quickly. Just curious? None of the beans and lentils I've cooked with have had too many based on a 1/2 cup serving size (of beans alone - that 1/2 cup stretches far and wide into soup or stew). Meaning 1/2 cup would stretch into several bowls, not to mean I only use 1/2 cup in the entire recipe. Each of these recipes makes tons of soup. Hope that helps! not really low-carb, but thanks anyway. there are some good ideas here that could be easily tweaked to become truly low-carb. Don't think Zaxby's chicken fingers have a place on the table though! Low enough for me to lose 35 pounds. 5 Zaxby's chicken fingers have 11 net carbs which is well within my daily limit, but thanks anyway. Mandy can put whatever she wants on HER table. She didn't really ask for your opinion, but thanks anyway. wow, no need for the snark! Mandy explained this is HER diet HER way...I got the same treatment when I did a low carb diet awhile back. My plan was just eat a serving of carbs at dinner, because I wanted to eat like normal with the rest of the family. Lost 35 lbs pretty quickly. Of course the carb-police told me I was doing it all wrong, I should eat my carbs in the daytime for energy, blah blah blah. Nevermind I had more energy than ever and that I lost 35 lbs in about 3 months. If you can't add something positive to the conversation, keep silent please. Thank you for this post I really like your recipes and this is what I'm needing to do now in my life ,I'm on my way to losing 150+ pounds. This sounds do-able and I'm going to try it! Congrats on your 35pounds that is really great! Thank you, thank you, thank you!! I have been following a low carb diet too and it is super hard in the South with all our wonderful fried foods (okra season's coming, don't get me started!) I have a question? Do you think we could make "grits" or even "cheese grits" with the cauliflower? I miss shrimp & grits and for breakfast w/ overlight eggs too!!! Congrats on the weight loss! I have been missing your posts and would love for you to keep us updated on new low-carb recipes you try or new restaurant finds. I love that your food choices are REAL foods that we could all enjoy, not pre-packaged cardboard! I think even I could do this!!!!! Thank you for sharing. I'm going to give this a try....not just for the weight loss, but for the energy, too! Continued success to you. So glad to see you in my email box again. I lost 70 lbs in8 mos. no beer, a good 30+ min brisk walk merging into a walk/ jog and breakfast, everyday! Eating what I usually do but watch portions and less carbs but they are still in the diet. Like she said. A lot less carbs and you do feel better ! Wow! That's incredible! I'm so very happy with how I'm eating. I never feel like I'm missing out (because I'm not over-the-top with it). I feel GREAT! Oh! And never deprive yourself. A bite or a taste helps . scotch eggs are a super easy, delicious, on-the-go low carb breakfast.. just make sure to soft boil the eggs or the yolks over cook while baking. Your meal ideas are very close to what I eat now. Thanks for the new ideas too :) Oh, and do you have any before and after pics?? I agree totally! I actually had some sushi today because I've been craving it for a month! I don't have any pics though if I keep losing I'll try to post some! Congrats on the weight loss! My wife and I are following a low carb, high protein diet as part of her pre-surgery (yep, THAT surgery) doctor supervised weight loss program. I absolutely love this blog and the recipes that you've put up are amazing. Even for someone like me, who always enjoyed cooking, but has never been able to really "experiment" in the kitchen, you've helped out a lot! We're following pretty closely to the Keto Diet plan (low carb, high fat -good fat-). There are some exceptions along the way, but since my high water mark, I'm down 30 lbs and my wife is down 22+. Amazing what getting rid of Mtn Dew and carbonated beverages will do to help kick start things. Good luck to the both of you too! Just seen your story from last year. How are you both doing since the surgery? Congrats on your weight loss! Isn't that a wonderful feeling!!! Keep it up and you will never return to carbs. I've been lo-carb for over three years and have not regretted a day of it. You do feel so much better. Keep us informed at to your progess. As a diabetic, I've eaten low carb for years. I was wondering, what is the best way to shred cauliflower for fried "rice"? I've been experimenting with cauliflower recipes that use riced or crumbled potato salad recently. I just put cut up cauliflower in a food processor and pulse until it looks like rice. Pretty easy to eyeball. Also Green Giant makes cauliflower crumbles which I found at Target in the fresh food section. A little bigger than rice size, but I made a 'potato' salad with it and COULD NOT BELIEVE how good it was......I"m nonot a cauliflower fan really. riced or crumbled CAULIFLOWER....it should say above. Hello Mandy, First of all congratulations on your weight loss. I've been searching for recipes on low carbs and yours sounds so delish. Bur I was wandering if you have a cook book on your low carb and meal ideas that I can order from you. I'm sorry, I don't! Maybe some day! Start with half the package jello mix and add more to your taste if you want to. mix well and spoon about 2 tablespoons into cupcake liners and store in airtight container in the fridge. It ends up being about 5 carbs per serving, but perfect when I have that sweet craving. I can't wait to try that cheese cake recipe, thanks for that! You say "Stay Active". What do you mean? Are you following an exercise regimen or just not being a couch potato? Love your recipes. My whole family is following the basic atkins diet which sounds very similar to this. We are keeping out carbs below 20 with the carbs we can count. We usually don't count the carbs of veggies. So we are probably between 20-30 total. The weight is not coming very fast. Do you watch fats, calories or protein grams? I don't count anything but carb grams usually, but when I find I'm not losing weight quickly, it's because of not enough water. A good rule of thumb is to take your current weight, divide in half, and that's how many ounces of water to drink, but avoid going over a hundred ounces. I still weigh a little over two hundred, but I stick to 100 ounces, no more, and that helps me to lose anywhere from 3-5 pounds a week. I've lost 50 so far. If I've been drinking enough water and I'm still not losing, I'll either do a three day egg fast (Google or search on Pinterest for ideas) or I as a last resort go off the low carb for a day or two to 're-set'. Honestly, for me, it's almost always the water. Hope that helps! thank-you so much! Im just starting low carb....I agree with you about how light and energetic I feel. The only thing I really hate is having to eat so often.. (I'm hungry about every 2 hours)....but I'm doing a shake, so that helps. I'm so happy to hear of your successful weight loss. As crazy as it sounds..I'm in my 70's and have lost over 167 lbs. My Dr.'s are scratching their heads after initially telling me that it would kill me (like I had much of a life at 388 lbs.). I found LOW CARB to be my miracle! I do the version using PLENTY of "healthy fats" such as real unsalted butter, olive oil, coconut oil, 4% fat cottage cheese, bacon, eggs, and avocado's (1/2 or whole) for breakfast can be surprisingly delicious and filling! !I've now dropped from "MORBIDLY OBESE" to OBESE. I have a LOT (probably 50-75 lbs. )of loose skin which cannot be surgically removed because my age makes me a poor candidate for surgery. But I'm still busy with family (4 grand-kids and 5 great grand-kids)as well as friends and neighbors too! By the grace of GOD I'm still healthy enough to be part of their live and not laying in a nursing home!! This is a really well thought out guideline for low-carb eating and the explanations are easy to understand. Like you say,everyone can tweak it some and make it there own,but it is a relief to know there is lots more than eggs! I am just now finding this post! You are a God-send and inspiration! We have wanted to go low carb for awhile but have to admit, I just go blank on what to fix. I have subscribed to your blog but for some reason, I am not receiving your posts-happened when Windows updated. Don't get several blogs I subscribed to, even though you are on my "safe senders" list. Have their been any updates to this post with more recipes? If not, is it a possibility? Thanks for your help and inspiration and most of all, your willingness to share! You ought to drink no less than eight ounces of water every day for each 20 pounds you weigh. At whatever point you feel hungry, have a glass of water. I pinned some of these yummy recipes. I will have to alter most of them though. My Husband has had Type 1 Diabetes (not the same as Type 2 diabetes which is diet related) since he was 14. 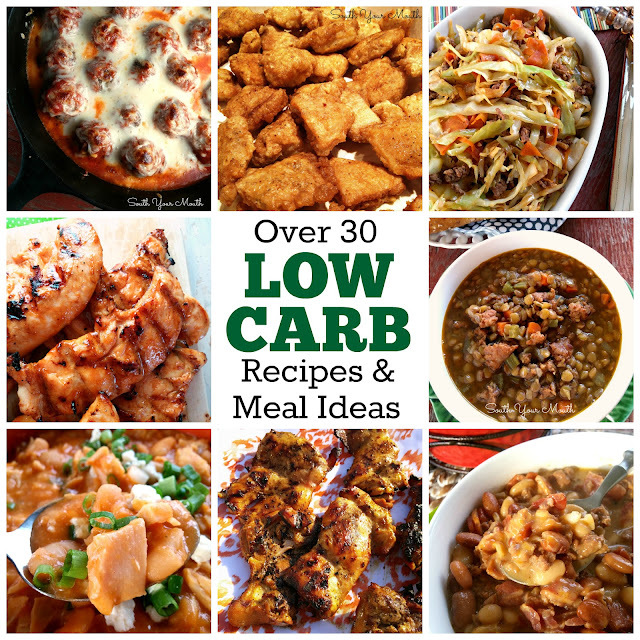 While most of these are low carb, the sugar content is a bit high in some of these recipes. Easy tweaks! Thank you for these yummy recipes! These are some super recommendations for low-carb eating! I'm happy for you and your success. I'm going to be trying LOTS of these suggestions! Thanks! Studies indicate that obese adults aged 20 to 45 are at nearly four times the risk of developing diabetes and more than five times the risk of getting high blood pressure than normal-weight adults. In 1998, a new weight loss drug, sibutramine (Meridia), received a thumbs-up from the FDA, even over the objections of its own scientific advisers. It is designed to treat serious obesity, especially cases accompanied by other health problems, such as diabetes. I'm happy with the bean recipes, but I think I'll make my own seasoning mix. The ingredients in the packet in the bean mixes is pretty scary. I pretty much like your proposals as except from being goal oriented the all seem yummy!! !